Josh Fell in action for Spen Victoria against Hopton Mills. 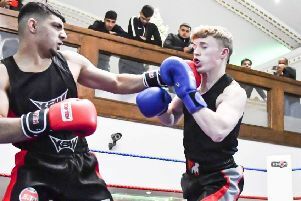 Heckmondwike and Carlinghow produced a battling display but it wasn’t enough to prevent defeat against Bradford League Conference leaders Jer Lane last Saturday. Tom Watson (60), Raqeeb Younis (38) and Jonny Lister (34no) were the main contributors as Jer Lane posted 264-8, with Javed Iqbal claiming 3-39 from 15 economical overs. Heckmondwike were reduced to 93-8 and 120-9 in reply but fought back with a brilliant 10th wicket stand of 83 between Iqbal (61no) and Andrew Crowther (38). Although the last wicket defiance wasn’t enough to prevent a 61-run defeat, it helped Heckmondwike pick up four batting points but they stay bottom of the table. Crossbank Methodists also showed battling qualities but were unable to prevent defeat to third placed Adwalton in a low scoring encounter. Adwalton skittled out Crossbank for 72 as Gareth Lee (6-10) had them in a spin. Adwalton hit problems too and lost seven wickets reaching their target as James Abbott took 4-27. Adwalton are six points behind Jer Lane and just one off Oulton, who defeated Sandal by 72 runs. East Leeds batsman Jacob Naylor made the day’s highest individual score in his side’s 94-run win over Great Preston. Naylor struck eight sixes and 21 fours as he made a stunning 172 as East Leeds posted a total of 301 before restricting Great Preston to 207-9.